Cast: 8 m, 7 w, 9 flexible and extras, doubling possible. Headstrong Rosario, leader of a feisty gang of child thieves, has a secret: the young man everyone knows as Rosario is really a teenage girl, climbing the ranks of a clandestine criminal guild. To join the illustrious Council of Convicts, she needs all the help she can get from her friends to steal the Madonna statue off the newest church in the city. But not everyone is thrilled about her risky plan, and Rosario suffers a double betrayal that threatens to destroy her plans and tear the gang apart. 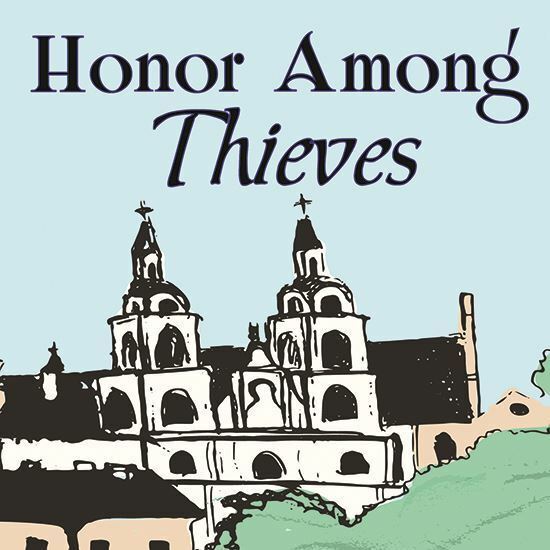 Tackling themes of sexism, loyalty, and deceit, Honor Among Thieves is the story of one girl’s dangerous ambition. Approximately 70 minutes. Searching for a play to produce for the annual production camp I direct inspired me to write my own. I wanted an ensemble cast, not four main characters and a bevy of two-line bit parts. I wanted a text that older students could dive into and analyze, and a text that younger students could still understand. My own love for fantasy and adventure (and maybe even my recent trip to Spain) pushed me to create a work I would have loved to perform as a kid. I wanted a story I could cheer for. Where Bastián and Rosario try to devise a plan for the heist but end up confronting old wrongs. It’s the scene I spent the most time on, and I love how the audience gets to see a different side to Bastián as someone who struggles to keep the group together, and feels conflicted about his feelings for Rosario. There’s a lot of trust in that relationship, but there’s a lot of broken trust as well. They almost get to a breakthrough, but then they both pull away. It’s maddening. The characters are based more on conceptual goals, than people in my life. Rosario comes from a desire to create a heroine who is mildly unlikeable. She’s arrogant and selfish and clever, but she becomes more compassionate throughout the play. I wanted her to have a female friendship with difficulties, which is why I created Penelope. Pen reminds me of a friend of mine with whom I share large political differences. I wanted to toy with the idea of how can we promote tolerance when our opinions are so different. My only true goal was to create a play where every actor was happy and excited for their role. I had a student tell me during the premiere production that she saw a piece of my personality in every character, and that she thought her part, Mary, was the best in the show. That made it all worthwhile.